No more worrying about losing keys, forgetting password or unauthorized key duplication! The IntelliLock™ can turn your smart device into a key. It unlocks with a tap within few seconds ,using your unique fingerprint. The Key-less design provides flexibility as you share access with friends, family, colleagues and employees, etc. Keyless Design - Unlock the padlock by using your fingerprint or via your smartphone. Different Unlocking Methods- use button/fingerprint/password to unlock on APP, or input fingerprint on the padlock to unlock. Easy to use- Simply download the free app for IOS & Android and scan the QR code for the lock. Multiple locks- A user can control multiple locks from the app. Assign Multiple Users- Store up to 15 fingerprints per lock and share access with others via the app. App Control- User can monitor the unlocking and sharing record. Durable and High Quality- Made of heavy-duty zinc alloy with electroplating process, anti -impact and corrosion resistant. 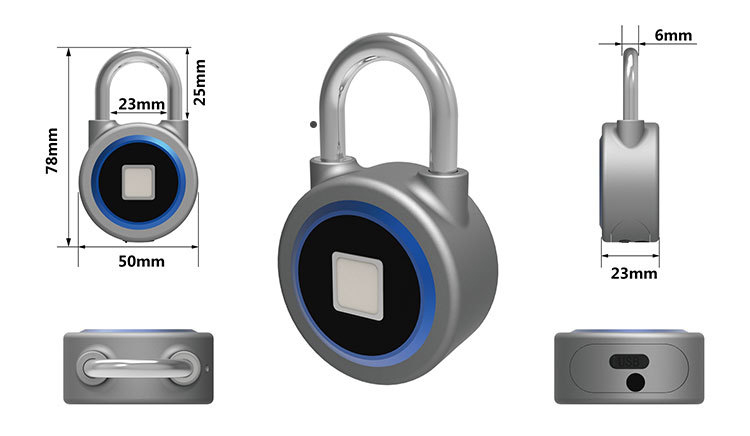 IP65 Waterproof- High waterproof grade allows for the lock to be used outdoors in any weather condition. USB Rechargeable - Built-in Polymer battery can be easily charged with a USB cable. Battery Display- Battery of the lock is displayed on the App, a perfect reminder to charge your lock timely.